This Dometic coolers review has been a long time coming. Today, we are going to look at some of Dometic’s products and see just what makes them unique. Ready? Great, let’s get down to it! Now, before we dig deep into Dometic coolers review, allow us to give you a brief introduction to the story behind Dometic coolers. It all started at the beginning of the 20th century when Swedish engineering students decided to act on a long time idea of theirs. Up until that time, cooling cabinets had been engineering monstrosities. They involved numerous moving parts, compressors, and a lot of ice. Carl Munters and Baltzar von Platen believed that they could make the whole thing simpler, and much cheaper. They believed it was possible to use heat to create a cooling effect. This might sound like a normal idea today, but you have to understand that at the time it was revolutionary; so revolutionary that, when they succeeded and received a patent for their invention, they received praise from none other than the great Albert Einstein himself. He called it ‘a stroke of genius,’ a term that was very apt looking back as these two young engineers had, in effect, invented the world’s first refrigerator. Their invention soon attracted the attention of large manufacturing companies, with Arctic, a Swedish company, leading the pack. The company soon bought the manufacturing rights for the refrigerator. Two years after they acquired the manufacturing rights, Arctic was purchased by an even larger company that dealt in appliances: Electrolux. Electrolux cashed in on the refrigerator and mass-manufactured millions of them for middle-class homes. The refrigerator quickly grew in popularity all across Europe. It was in the 1950s, however, that Electrolux brought its products to the United States. In this case, it was targeting the leisure market in America and started buying up leisure brands wherever it made sense to do so. It established a separate division for leisure products and called it Dometic. That’s where the brand was born. Electrolux soon got swallowed by another firm, EQT, but Dometic never died. It maintained the innovative tradition first established in its origins in the lab of those ambitious young swedes many decades past. The brand is involved in creating novel and often times revolutionary solutions for people in mobile homes who need effective coolers. These include both electric and non-electric coolers, and they are an industry leader in both categories. Such is their success that in 2015 they had an IPO and became a publicly traded company on the Stockholm Stock Exchange. Okay, enough with the history lesson! Let’s talk details. 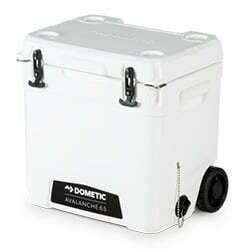 Dometic has a great lineup of coolers, both powered and non-powered, that is good for a variety of purposes. They also have a ton of other products catering to such areas as hygiene & sanitation, climate, and food and beverage storage. However, for this review, we’ll strictly look at the coolers. These coolers are made with mobile customers in mind. They are mostly for use on long distance travel in cars, RVs, trucks, and even boats, and are known the world over for their unmatched performance. This is essentially a Dometic portable refrigerator and is designed to fit just about any vehicle. The Dometic CFX is a compressor fridge with some models including freezers as well. It will keep your food and drinks well chilled while you’re out on the road. Regarding capacity, you’ve got the Dometic CFX 28 with its 43-can capacity on one end of the spectrum and the Dometic CFX 100W with its 146-can capacity on the other. 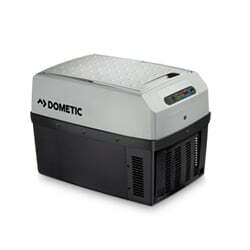 The Dometic CFX series features digital temperature displays, reinforced corners, steel hinges, and a wire basket with a divider included. The cooling performance is also fantastic, even at very high external temperatures. 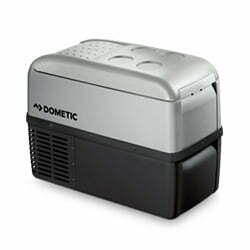 Dometic CoolFreeze CFX 65W compressor cooler with special CFX electronics, energy-saving and quiet operation. The Dometic CF series is a portable cooler meant for taking with you wherever you go. While the massive Dometic CFX is meant to be carried on the road, the Dometic CF was made with campers and tailgaters in mind. It is much lighter and even features comfortable shoulder straps. It is also very slim and can fit in confined spaces. Don’t be fooled by the slim and lightweight design, however. 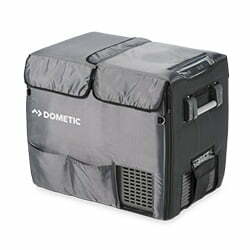 This Dometic cooler features a wide range of options. On one end of the spectrum, you have the Dometic CF 18, with an 18-liter capacity, while on the other end you have the Dometic CF 110, with a capacity of 106 liters (Yes, you read that right!). 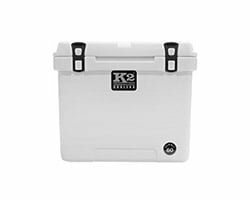 The cooler’s performance is highly efficient as it doesn’t consume much power and still manages to chill your beverages pretty quickly with its turbo function. All CF units also include a convenient interior light. The Dometic CDF series of coolers is a lightweight and highly efficient range of products designed for use with DC power sources. This, and the fact that most units are designed to be able to deep freeze food and beverages are the main points of difference between this series and the Dometic CF series. The CDF series was made for those looking for a truly lightweight, battery operated, Dometic portable freezer as the smallest option has a capacity of 10.5 liters. This also seems to be the only available option in this series, according to Dometic’s website. We’re looking forward to seeing more portable freezers offered under this series. The Dometic TropiCool series is a high tech line of coolers capable of both cooling and warming the contents. It can cool the contents up to 30 degrees Celsius or 86 degrees Fahrenheit below the surrounding temperature and can achieve temperatures of up to 65 degrees Celsius or 149 degrees Fahrenheit on its warming function. 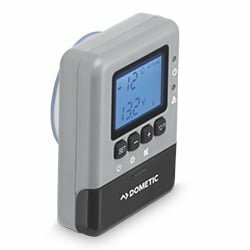 The Dometic TropiCool is compatible with AC and DC power sources and features adjustable temperature controls so you can have your food and beverages as cold or as warm as you want them. This line also offers a wide range of options: the smallest model is the Dometic TropiCool TC7, with a capacity of 7 qt, while the largest model is the Dometic TropiCool TC35, with a capacity of 37 qt. When it comes to Dometic ice chests, the brand has only one series under this category: the Dometic Avalanche. 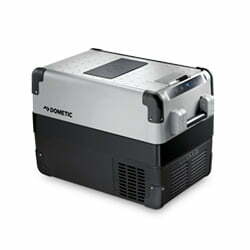 Dometic are well known for their innovation when it comes to powered coolers. The Avalanche proves that they are just as innovative, even with non-powered coolers. This roto-molded cooler is capable of keeping your food and drinks cold for up to 10 days, something that even specialty cooler brands can hardly boast of. It has thick internal walls that provide excellent insulation and a robust construction featuring stainless steel. This cooler also features strong latches that keep everything in and reversible feet on the bottom that can be switched from skid to non-skid, depending on the demands of the situation. It’s also compatible with dry ice. The Dometic Avalanche features 3 different size options. The Dometic Avalanche 35L is the smallest, with a capacity of 30 qt. On the other end of the size spectrum is the Dometic Avalanche 65LW, with a capacity of 62.1 qt and wheels on it (more wheeled coolers here). Dometic are well known for providing numerous solutions for people who are mobile. Whether you live in an RV, travel a lot in a truck, or spend most of your time out at sea in a boat, Dometic will provide you with solutions ranging from air conditioning to cookers, to yacht design. With such a wide range of products, it’s natural to fear that their coolers might not be the best in the industry. After all, there are lots of companies in the market focusing on coolers and doing a great job at it. Why should such a company with such a diverse product range be able to compete? That’s where Dometic proves itself as a brand. 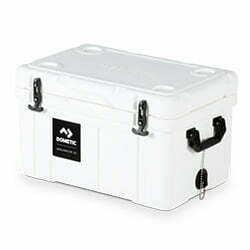 All of Dometic’s products are innovatively designed, and their coolers are among the best, if not the best, in the industry. Dometic coolers, like most other Dometic products, are designed for mobile people who want something that will serve them well as they travel from place to place. The powered coolers, in particular, are made with long-distance travelers in mind. If you’re going to be out and about for more than a week at a time, then a powered cooler is the best options for you. 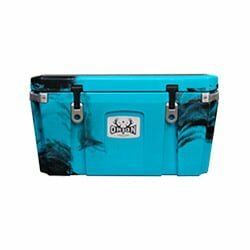 The longer you’ll be out, the greater the capacity you’ll need so you should proportion the size of the cooler you purchase to your capacity needs. 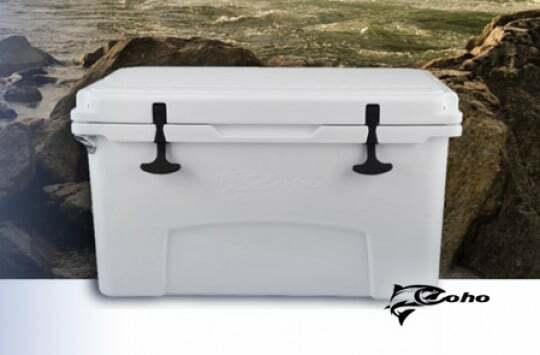 If you’re an adventurer or are just looking to have a cooler that will keep your beer and fish cold, then the non-powered Avalanche series should be perfect for you. Its performance is abreast with that of other industry leaders, and the price isn’t punishing. All Dometic products come with an initial 2-year warranty out of the factory. Sometimes, Dometic offers to extend the warranty to 3 years for people who register their products on their website. This may not seem very good compared to the lifetime warranties offered by some competitors in the coolers’ market, but at least you know you’re getting a high-quality product that is likely to last a lifetime. Besides, the warranty is understandable for the powered coolers because the electric components and parts can be pretty expensive to fix and replace. We are at that part of the review where we compare the cooler being reviewed to the gold standard of all non-powered coolers: Yeti. 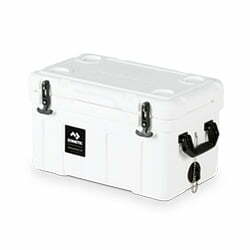 Of course, Yeti has made a name for itself in the coolers market by delivering nothing but unwavering quality and guaranteeing durability like no one else. 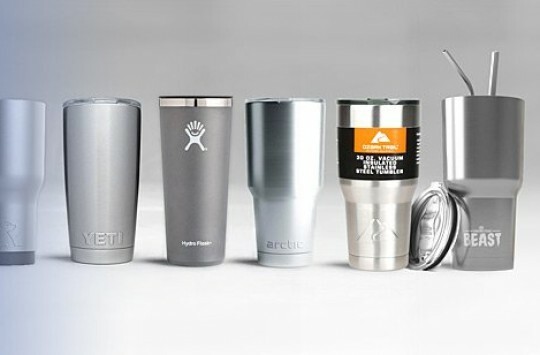 When it comes to ice retention, the Yeti Tundra and Roadie are most comparable to the Dometic Avalanche cooler. These coolers can offer up to 11 days of cooling, according to Yeti. The Dometic Avalanche, on the other hand, offers up to 10 days of refrigeration. We’d say it’s a tie in this case. Yetis are well known for having a strong roto-molded build that guaranteed durability. From being bear-proof to having sturdy latches and lids capable of keeping the cold in, it’s pretty hard to beat the Yeti. The Dometic Avalanche, while pretty strong, still isn’t capable of holding a candle to coolers like Kong, Orca and other Yeti-like in terms of strength, so the Yeti wins this one. However, it’s still a reliable cooler and can do its job pretty well. The Yeti Tundra and Roadie have a much broader offering in terms of capacity and color as compared to the Dometic Avalanche. With just 3 size offerings and one color, the Avalanche seems like a loser here. However, it does a pretty good job of catering to different needs. You’re likely to be comfortable with at least one of the Avalanche’s offerings, depending on your needs, while you’re probably going to face some analysis paralysis with Yeti’s extensive offering. We think this one’s a tie. Yeti is Yeti. They’ll always be an industry leader, and it will be pretty hard for any brand to beat them. On the other hand, Dometic coolers do the job pretty well, and you can always be sure of getting nothing but quality from this brand. In this case, we would say that, if you’re a die-hard Yeti fan, don’t let us change your mind. However, if you’re willing to get something nearly as good for a lower price, Dometic should be right in your ballpark. 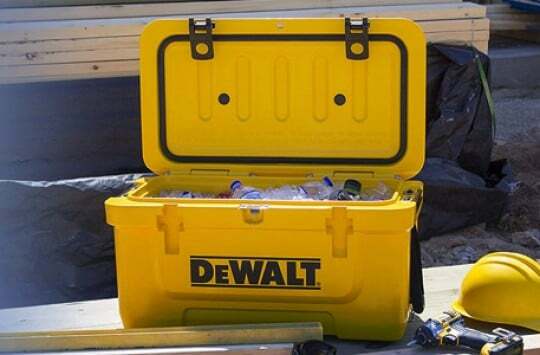 What’s better than a Dometic cooler? A Dometic cooler accessory, of course! These accessories are meant to help you with your powered Dometic coolers and serve a variety of functions. Let’s have a look at 3 of them. This slide mount is designed to make it easy to lead and unload your Dometic CFX series cooler in and out of your vehicle or boat. 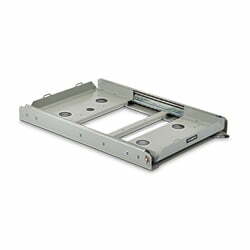 Each slide mount can carry up to 220 lbs. 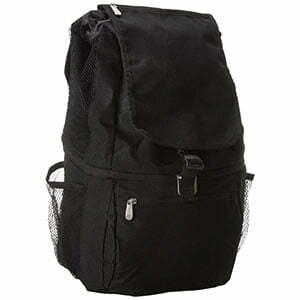 of weight, features 4 heavy-duty straps with quick-release buckles, and has a 1 year warranty. This protective cover acts both as protection for your Dometic CFX series cooler and extra insulation to help it maintain its temperature even longer. 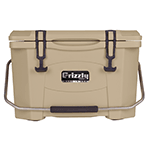 The bottom and ends of the cover are made from rubber-coated nylon, which has unmatched durability, while the cover features eyelets which you can use to secure the cooler to a vehicle. It also has a phone pocket that you can use to store your phone in. This remote display helps you know the state of your cooler without having to take a peek at the temperature display all the time. You can be far from your cooler and still know what’s going on. The display tells you the temperature and power source conditions of the fridge. It also features alarm and battery protection settings. Dometic coolers are sold all over the world. The process on their website involves picking the cooler you want and clicking on the ‘Find a Dealer’ button, which allows you to input your address and see which dealers are closest to you. This is different from other cooler brands, which allow you to purchase their products directly from their site. If you think all that is a lot of work, you can simply go to Amazon to buy your Dometic cooler. All their series are sold on Amazon by a variety of sellers and buying from there allows you to enjoy some of the benefits of purchasing on Amazon. These include having buyer protection, getting free delivery in some cases, and being able to read customer reviews from others who have bought the products before and are willing to share their experiences. 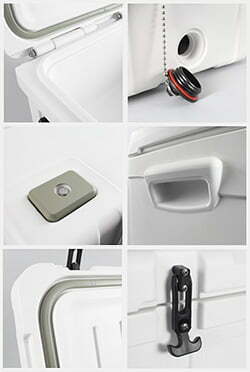 Dometic is a great company offering great products for those into mobile living. In line with this, their coolers are some of the best in the industry and are guaranteed to serve you faithfully for a long time. 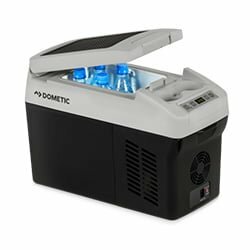 Whether you’re looking for a powered or non-powered cooler, Dometic has you covered with their innovative offerings.